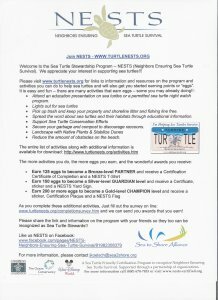 Summary: The Neighbors Ensuring Sea Turtle Survival (NESTS) program promotes the protection of sea turtles and their nesting beaches by teaching and encouraging community stewardship. NESTS provides opportunities for local citizens to become directly involved in stewardship of the beach and dune ecosystems and the wildlife that depends upon a healthy coastal environment. Stewardship is fostered through teaching coastal residents about the importance of protecting the coastal environment and encouraging the completion of simple activities that reduce negative impacts to sea turtle nesting beaches and other coastal habitats. The program promotes increased stewardship on the part of individuals and families living on or near coastal communities. The program directly benefits Florida’s sea turtles and nesting habitat. Sea to Shore Alliance will lead responsibility for the program, continuing efforts to increase participation, and targeting more coastal businesses, especially hotels, rental properties, and condominium– those entities that are likely to have a large impact on sea turtles and their nesting beaches. Results: During grant period, Sea to Shore Alliance transitioned the NESTS management to Sea to Shore Alliance, enhanced NESTS participation through social networking, and followed up with previous registered NESTS participants to encourage higher levels of participation. We worked with Gumbo Limbo Nature Center to identify condominium communities in Boca Raton, and met with many during a trip to South Florida. We greatly increased the number of events attended and outreach opportunities pursued, taking advantage of the start of nesting season as a valuable time to be thinking about sea turtles and their nesting beaches. We were able to target several businesses in beach communities in Cocoa Beach, Melbourne Beach, Destin, and Fort Walton Beach, as well as elsewhere in Florida.